Life is full of uncertainty, and no one knows what the future holds. The field of elder law is dedicated to helping clients plan for a bright future while being prepared for whatever life throws at them. Elder law is not only for seniors, as the field of elder law encompasses financial and retirement planning; disability planning; legacy planning; and more. One-in-four 20-year-olds today will become disabled before the end of their working life, while more than 70 percent of seniors 65 and older will require nursing home care for at least some time in their lives. You need to be prepared for the possibility that you will become one of those statistics, as well as planning ahead for things like college, a happy retirement, and a strong legacy. 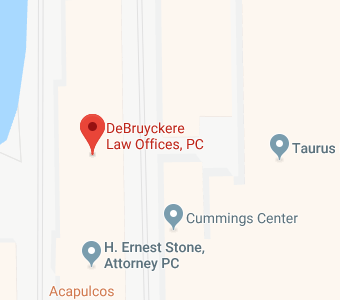 DeBruyckere Law Office can help. What does a Medicaid planning lawyer do? How can an elder law and Medicaid planning attorney help me? Incapacity planning: You must be prepared for what kinds of medical care you will receive; who will manage assets; and how you will be cared for if you suffer an illness or injury that leaves you temporarily or permanently incapacitated. Trusts, powers of attorney, and living wills help to ensure you are prepared. Retirement planning: Most Americans don’t have enough saved for a secure retirement. An elder law attorney helps you set goals, use tax-advantaged accounts like IRAs appropriately, and find ways to protect your financial assets as you save for retirement. Estate planning: Avoiding estate taxes, facilitating the seamless transfer of assets; business succession; and probate avoidance… these are just some of the many things elder law attorneys help you to do as part of your estate planning process. We help you create wills and trusts; incorporate your business; create charitable foundations; and take other essential steps to leave a strong legacy. Asset protection: For those serious about building wealth, protection of your assets is essential. Our goal is to keep your property secure so you can enjoy the fruits of your labor. These are just some of the many services offered by experienced elder law attorneys at DeBruyckere Law Office. Our firm works with you to do everything from naming a guardian for minor children to addressing LGBTQ estate planning issues and more. The service we provide is tailored to your needs as we work to make the process of planning for the future easy and stress free. A Medicaid planning lawyer provides assistance with one of the most important aspects of elder law: planning ahead for nursing home care. Nursing homes cost hundreds of thousands of dollars, none of which is covered by insurance unless you are one of the few patients who goes into a nursing home only for a brief time to receive skilled care. For most people who are sick or hurt and who need nursing home care, the only payment options are Medicaid or private pay. Private pay can dwindle your savings down to nothing, but Medicaid is means-tested with resource limits so you won’t be covered unless you’ve spend down your savings and even sold some assets. With Medicaid planning, however, you get covered for nursing care when you need it while still preserving your legacy. DeBruyckere Law Office helps you to determine if you need a Medicaid plan, and helps you to create that plan to protect your finances. How can an Elder Law and Medicaid Planning Lawyer Help Me? DeBruyckere Law Office is committed to helping individuals and families protect their financial security and stability by making smart plans for a strong future. With offices in Londonderry, NH; Beverly, MA; Nashua, NH; North Andover, MA; and Woburn, MA, our attorneys have offered assistance to many clients trough Massachusetts and New Hampshire. We offer advice to people at all income levels and life stages, and we will make it easy for you to make your comprehensive plans. Give us a call today to find out more about how we can help you.